I love fish. With that said I have to say that salmon is one of my favorites. One of my favorite ways is to make it on an indoor grill with a little lemon and Mrs. Dash, super simple and really tasty. But sometimes it is a good thing to change things up and make things that you would never think about making in your wildest dreams. Such as this glazed salmon recipe, the combination of ingredients was a little surprising to me. Brown sugar (I know not so healthy, but it is not a lot so I think I am safe), dill weed, red pepper. Is it just me…? I know when I showed the recipe to Mike, he was not too sure that he would want to eat it. But I have made some recipes that I have questioned the combination of ingredients and they have turned out to be quite flavorful. Well the same thing happened with this one, it was yummy. The brown sugar gave a touch of sweetness and the red pepper gave it just a touch of heat. 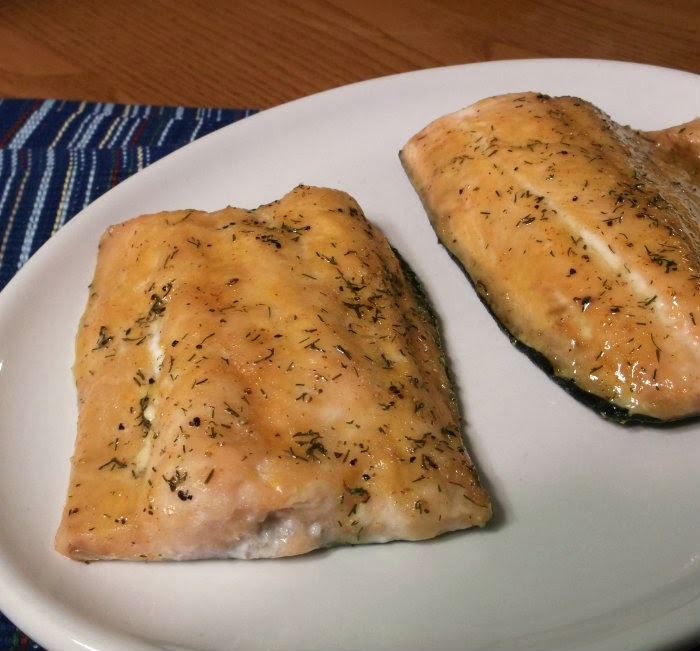 If you are tired of your salmon recipe and are looking for something with a little different flavor I would really advise you to give this one a try. 1. In a small bowl, combine the first five ingredients. Remove 1/2 cup save for serving over the broiled fish. (Heat this reserved 1/2 cup in the microwave just before serving the fish). Set aside the remaining mixture for basting. 2. 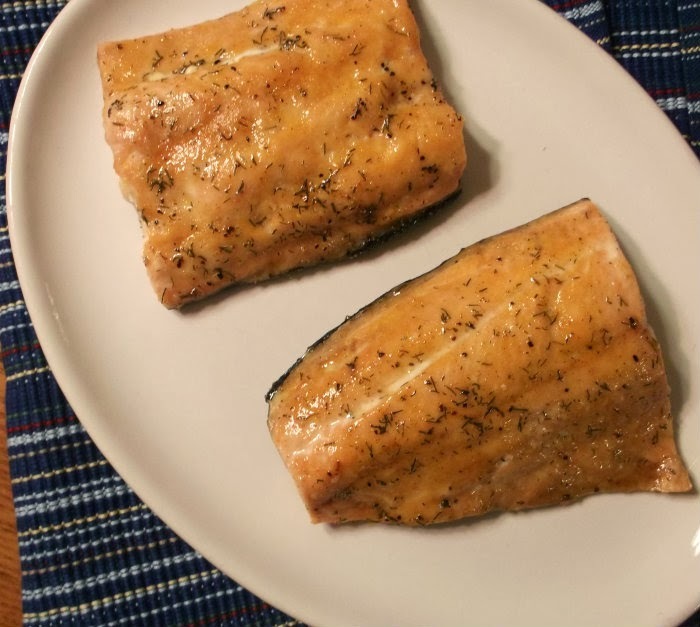 Sprinkle salmon with lemon-pepper. Spray boil pan with a non-stick cooking spray. Place salmon on broiling pan skin side down. 3. Place the salmon under the broiler for 2 minutes and remove, brush with the brown sugar glaze. 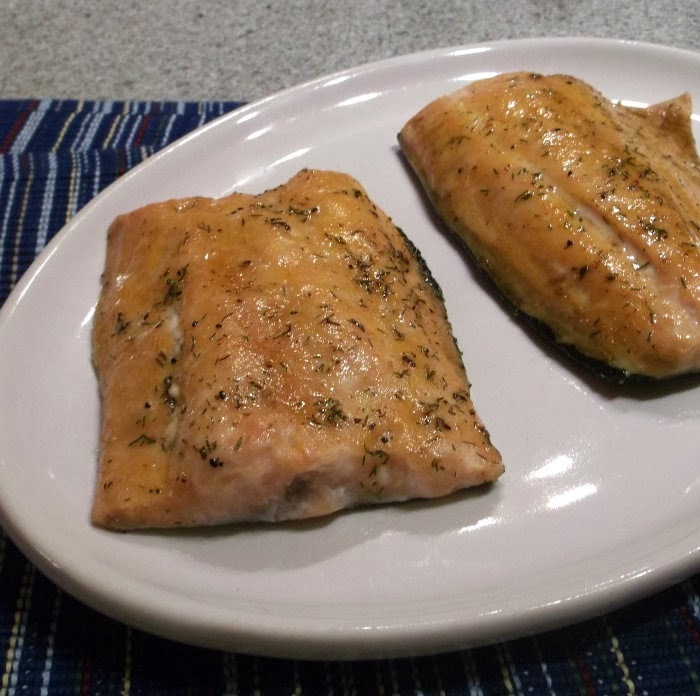 Continue to broil fish until done, basting occasionally, about 8 to 12 minutes depending on the size of your fillets. Ooo so much flavor in that glaze!! Perfect for sticking to your healthy eating goals! This is one of the reasons I’ve had such a difficult adjustment to the midwest from the east coast, I love fresh seafood. I think when your only option for seafood is pre-frozen, you have to be sure you’ve got great recipes for it. I’m a salmon lover like you are, so I’ll be trying this one. Salmon has such terrific flavor, doesn’t it? I love the glaze you’ve put on this – so nice. Great recipe – thanks.